Our return policy lasts 10 days from the day that you received the merchandise to us receiving the item in our shop . To be eligible for a return, your item must be unused and in the same condition that you received it—it must also be in its original packaging. Please clearly state RETURN on the packaging. We are not responsible for return shipping fees, and will charge a 10% restocking fee for each product returned. 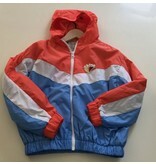 Girls jacket zip up in red, white and blue pattern. Hundred Pieces Canada. Hundred Pieces Vancouver. Welcome to isolabellakids.com. Thanks for visiting. As the oldest baby and children's clothing and shoe store in Vancouver, we are excited to exhibit the finest European collections--pieces that are both exclusive and original in Vancouver.